The calendar allows you to quickly identify any scheduling issues; including overlapping appointments, not enough time for breaks, or work orders without a scheduled appointment time. Filter the calendar for the dates you want to view. You can select either a Weekly view or a Monthly view to see work for multiple workers, or you can select Worker view to see an hourly breakdown per selected worker for a particular day. 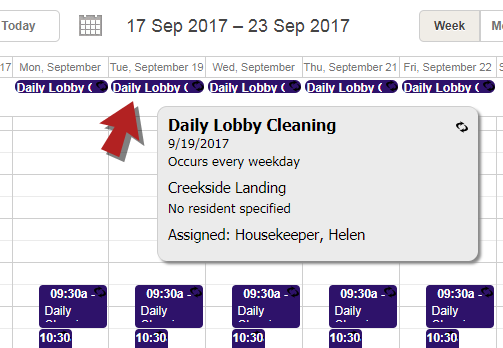 Use the department filter to show only Housekeeping staff, then check the box next to the housekeeper(s) whose work you need displayed. If a scheduled work order is overlapping with another work order, or the allotted appointment time does not provide adequate time in between work orders, you can quickly edit the appointment times for the schedule series. 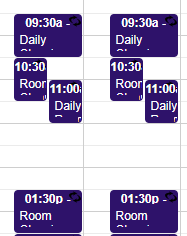 Double-click on the scheduled work order that needs to be edited. This opens the Scheduled Work Order Series pop-up window. Click on the Appt Start field and select a new start time for this appointment. Click Save. The Appt End time will automatically update according to the current estimated hours. To edit the length of the appointment, change the time listed in the Est Time field in the Labor panel. Sometimes scheduled work orders are set up without being given an appointment start and end time and will show at the top of the calendar. Click on the Appt Start field and select a start time for this appointment. Click on the Labor panel to expand it. In the Est Time field, enter the duration for the appointment. Click Save. The Appt End time will automatically update according to the estimated hours.